DoN‘s photo does no justice to Rick Wright‘s pristine photographs of hair balls shot against a stark white background now on display at Off the Wall Gallery @ Dirty Frank’s Bar. The first time DoN saw Wright’s compositions at The Center for Emerging Visual Artists he got kind of pissed off – is this what the competition in the art world is? WTF are a bunch of hair balls doing in an art gallery? And then they showed up in Dirty Frank’s Mid-Summer show and over drinks Rick explained the origins of the anamorphic fibrous images – a person who used to be in Wright’s life had Trichotillomania, an impulse control disorder manifested in hair pulling, twirling and twisting their hair into knots to be left sitting on tables, dressers, the mantle…It turns out the creepy little hair balls have a poignant back-story while transmitting secret messages. The gorgeous flower photos by A. Celeste Hardester are simultaneously decorative and technical, impeccably presented and meticulously composed, botanical yet romantic. Flowers are thought to emanate energy associated with particular stars; Hardester’s photos capture the star power of flowers. The salon style hanging @ Off the Wall allows a good number of works to be shown in a limited space; Mid-Summer @ OTW was curated by Jody Schweitzer, hand picking pieces from the studios of former OTW award winners including Robert Bohne, Bob Jackson, Debbie Bonacci, Annette Saggiomo, Avalon Clare, Susan Stromquist, A. Celeste Hardester and Rick Wright. Through October 2, 2009. This entry was posted in Art in Philadelphia, Dirty Franks, Fine Art Philadelphia, Mixed Media Art, Off the Wall Gallery, Paintings Philadelphia, Philadelphia, Philadelphia Art, Philadelphia Art Galleries, Philadelphia Art Shows, Philadelphia Artists, Philadelphia Artists, Philadelphia Photographers, Photography Philadelphia, Public Art, Uncategorized on August 27, 2009 by admin1. David Foss, The Grid, acrylic on wood panel, plastic, foam, 2009. David Foss, Between I and Thou, acrylic on canvas & foam. Kathryn Pannepacker, Art Trick & I Am A Magnet, embroidery coated with wax. Kathryn Pannepacker weaves anything within reach, including yarn, rags, thread, rope, book matches, even left over aluminum foil creating other-worldly decor as if for a Star Trek set. Both Pannepacker and Foss have an aura of tranquility and inner peace causing DoN to wonder if maybe they have been taken up, up, up…each donates much of their time doing outreach in the community. Foss is Executive Director of Da Vinci Art Alliance mentoring and promoting art carreers and Pannepacker has created several public murals and is currently weaving art with homeless people as part of Activities and Advocacy to End Homelessness every Thursday & Friday @ Arch Street Cafe, 740 Arch Street. 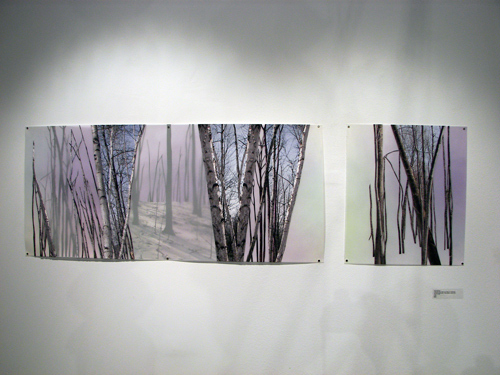 David Foss, Field Shift, acrylic on canvas, plastic & foam, 2009. Kathryn Pannepacker & David Foss at the opening of Parallel Lines @ Smile Gallery. Matt Lyons calls the art space “the biggest little gallery in town“; the gallery continually shows modern, edgy, sometimes difficult art by a continuum of Philly’s best artists. This entry was posted in Art in Philadelphia, Art Spaces Philadelphia, Fabric Art, Fiber Art, Fine Art Philadelphia, Mixed Media Art, Multimedia Art, Mural Arts Program, Philadelphia, Philadelphia Abstract Art, Philadelphia Art, Philadelphia Art Galleries, Philadelphia Art Installations, Philadelphia Art Shows, Philadelphia Artists, Philadelphia Artists, Philadelphia Pop Art, Philadelphia Sculpture, Plastic Art, Public Art, Uncategorized on August 22, 2009 by admin1. Jessica Hummel, Self Portrait took first prize with her photographic trilogy. The Plastic Club on Camac Street is hosting an outstanding show of art by artists models; who else but models have insight into the world of artists, absorbing and intuiting the complexities of visual arts. Many of the plastic club models have been mentored by the fine artists they pose for and artists are grateful for the intricacy and nuance of posing. Susan Stromquist is included in Off the Wall Gallery’s Summer Show of past award winners – her folded chalk and pastels are Rorschach pop melded with classic atmospheric naturalism. Karl Richard Olsen, Jeno, POR – looks like a bargain since this appears to be what’s known in the art biz as a masterpiece. Olsen draws and paints everyday, even while walking, honing his eye and exploring new ways to express his vision. Karl’s Flickr page is very cool and he’s currently completing one self portrait each day for 30 days. Rob Willis, Self Portrait – you know, DoN had to double check but he knew this drawing is by Willis, last year’s Model’s Show big winner, since a definite style has emerged over time – he’s really handsome, too. Jenn Warpole @ The Plastic Club’s Model Artists Exhibit. Rob Willis – the paint job on this chopper is Super Kawai, super flat, super cool – DuChamp for everyday life. Model Artists @ The Plastic Club through 8/22 – the club is holding special event workshops with moving model Stephanie Hyland – imagine long, slow croqui’s with the model slowly , steadily changing. Contact the club for dates and times. This entry was posted in Art in Philadelphia, Art Spaces Philadelphia, Ceramics & Sculpture, Drawings, Fine Art Philadelphia, Mixed Media Art, Models, Paintings Philadelphia, Philadelphia, Philadelphia Abstract Art, Philadelphia Art, Philadelphia Art Clubs, Philadelphia Art Galleries, Philadelphia Art Installations, Philadelphia Art Shows, Philadelphia Artists, Philadelphia Artists, Philadelphia Photographers, Philadelphia Pop Art, Philadelphia Sculpture, Photography Philadelphia, Plastic Art, The Plastic Club, Uncategorized on August 18, 2009 by admin1. Da Vinci Art Alliance is sponsoring the fabulous show, “Little Show of Horrors” @ Bartram’s Garden Gallery; alliance members were challenged to create works commemorating Charles Darwin’s 150th anniversary of “The Origin of Species”and carnivorous plants and all the artists went crazy on the theme of the fabled bug eaters. 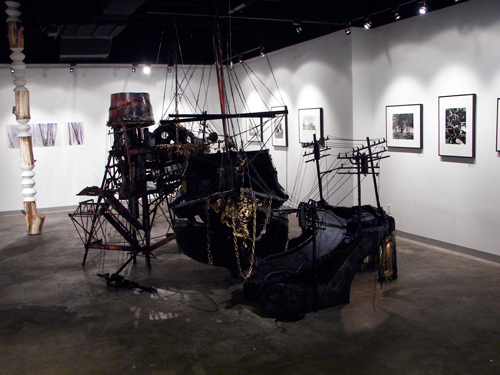 Above is Ted Warchal’s mixed media dream box and DoN Brewer‘s digital photo collage. Dexiang Qian, Girl with Venus Flytrap, oil on canvas @ Little Show of Horrors @ Bartram’s Garden Gallery. An honorable mention award winner, the painting explores the mystery and allure of collecting exotic plants. The display of carniverous plants in Bartram’s Garden is unbelievably fascinating, DoN highly recommends seeking out the display while the Summer is still hot. Venus Flytraps are indigenous to the Carolina’s and their habitat is being encroached upon, Bartram’s Garden offers a glimpse into a strange & wondrous world of ecology and botany and it’s fragility. Alden Cole’s Starlings tap into a deep psychological pattern recognition much like ancient man must have reacted to the Venus of Willendorf; the simple play of line and shape is loaded with narrative, a single line of graphite tingling the hive memory deep in our genetic code. Michael Diprinzio @ Bartram’s Garden Gallery “Little Show of Horrors” featuring Da Vinci Art Alliance members. Emily Orb with Bartram’s Garden director Louise Turen with “The Garden of Earthly Delights“, silk painting was honored with Best in Show. The reinvention of Bosch’s iconic dream scape is rendered with modern characters and technique, filling an entire wall of the historic space. Dr. Debra Miller presenting awards @ Little Show of Horrors. The Bartram’s Garden Gallery is in the oldest barn in Philadelphia and a wonderful space for art shows with the rough stone white-washed walls, wide wood plank floors and ancient windows – and air conditioning! Rachel Citrino, Ted Warchal (Most Creative winner) and the painting duo Karen McDonnell & Tony Cortosi @ Little Show of Horrors. The show runs though August 22nd and members of the alliance will be gallery sitting, Alden & DoN will be on sight all day Wednesday. The art party opening for Little Show of Horrors @ Bartram’s Garden Gallery sponsored by the Da Vince Art Alliance. 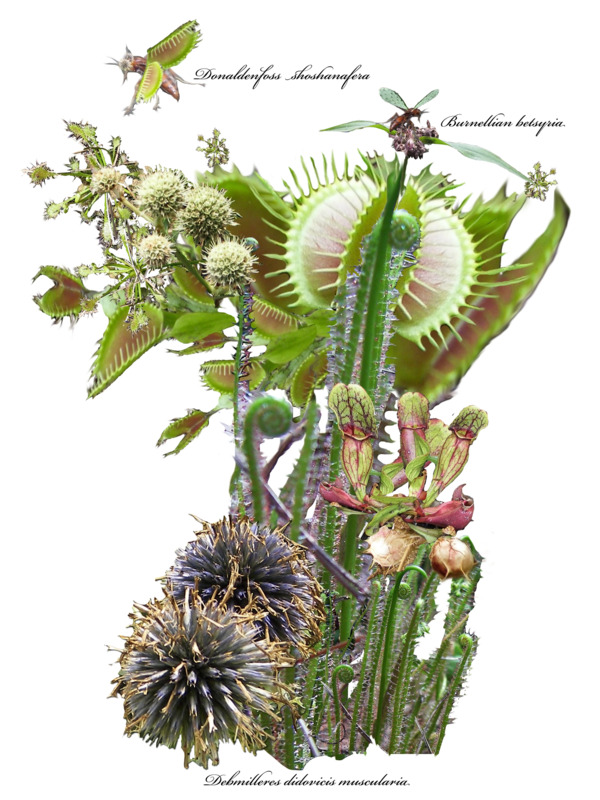 For a free downloadable version of DoN Brewer‘s Honorable Mention winner, “Botanical Print”, click here. This entry was posted in Art in Philadelphia, Art Spaces Philadelphia, Da Vinci Art Alliance, Fabric Art, Fiber Art, Fine Art Philadelphia, Mixed Media Art, Multimedia Art, Paintings Philadelphia, Philadelphia, Philadelphia Art, Philadelphia Art Alliances, Philadelphia Art Galleries, Philadelphia Art Installations, Philadelphia Art Shows, Philadelphia Artists, Philadelphia Artists, Philadelphia Gardens, Philadelphia Photographers, Philadelphia Pop Art, Photography Philadelphia, Uncategorized on August 17, 2009 by admin1. 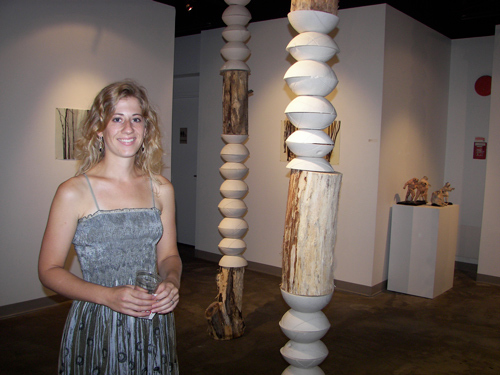 The Messenger is Already Dead – CFEVA Gallery @ 1521 Locust St.
Katie Murken @ Center for Emerging Visual Artists Gallery. Katie Murken’s contribution to The Messenger is Already Dead includes the Brancusi-esque columns and layered photo collages (a great steal-able idea – it took her three years to think it up, you can have it for free!). The cool thing about Murken’s work is the logical conclusions – like, “duh?” – why didn’t DoN think of that; a great meme is hard to find, impossible to control. In the corner are Scott Pellnat‘s “Land of Horror’s 1 – 4, wax and Barbie dolls”. 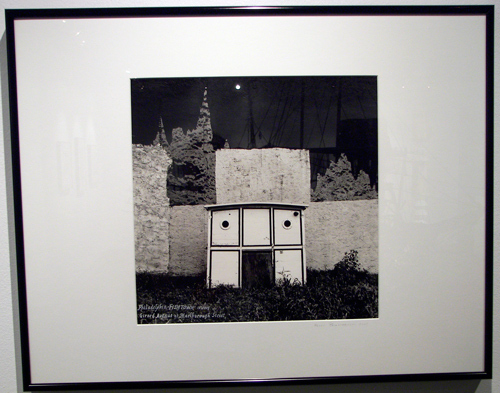 Peter Prusinowski is a master of the dark room, the gelatin silver prints of Fishtown are evocative of the neighborhood’s long established quirkiness and history. The blacks are rich and deep, the grays iridescent, the framing & lighting excellent so that the narrative readily absorbs into the consciousness with symbols and signs of civilization. Peter Prusinowski @ CFEVA’s The Messenger is Dead. With Peter’s work the medium is the massage. Scott Pellnat‘s room-sized installation is fantastically inventive and enthralling; created in his North Jersey back yard, the sprawling construction is a dream scape of shipwrecks, collapsed highways, hidden chambers and fools gold. Like a nightmare, there is no beginning or end, only feedback and feelings; Scott explained to DoN not all the teeny bookcases were filled with itsy-bitsy books as if the piece was still a work in progress. To get to the gallery push the black button in the elevator and you will be transported to a world of dreams, nightmares and extraordinary reality. View a video clip here. This entry was posted in Art in Philadelphia, Art Spaces Philadelphia, Center for Emerging Visual Artists, Collage, Mixed Media Art, Philadelphia, Philadelphia Art, Philadelphia Art Galleries, Philadelphia Art Installations, Philadelphia Art Shows, Philadelphia Artists, Philadelphia Artists, Philadelphia Photographers, Philadelphia Sculpture, Photography Philadelphia, Plastic Art, Uncategorized on August 4, 2009 by admin1.